Many people love camp fires, and here's is a way to make them even better with Mystical Fire. 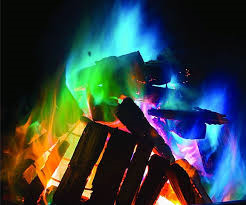 We've seen it referred to as mystical fire, rainbow fire and magic dust. It's a small sachet that you throw onto your camp fire and it turns the flames different colours.